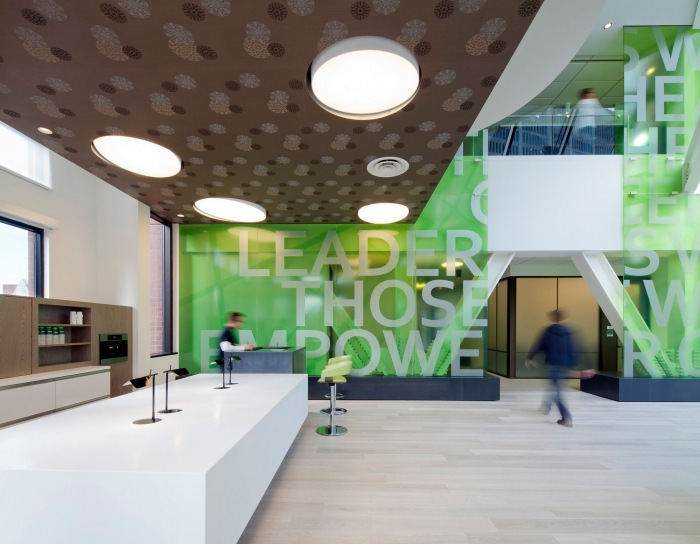 SkB Architects designed the offices for technology giant, Microsoft, located in Cambridge, Massachusetts. At approximately 85,000-square-feet, and encompassing five floors, Microsoft Cambridge involved repositioning the building entrance and creating a new customer entry at street level which leads to a 2nd floor Entry Plaza & Conferencing Center. This, in turn, connects to the 20,00-square-foot Microsoft Technology Center. Multi-purpose spaces on the 4th floor complete the customer / public experience. New elements to the project that have yet to been employed in other Technology Center U.S. sites include the interactive center, the “exploratorium,” a cafe, meeting / small event space, and an outdoor space adjacent to the cafe. The project features four basic work spaces: open workstations, cafe zones, long communal dining tables, and random tables and chairs. The two-story entry plaza contains dramatic 20-foot-high branded messaging elements as well as a reception point and hospitality zone, complete with espresso machine and a horizontal touch screen for a variety of leveraged content. SkB developed branding concepts and led the static branding design.